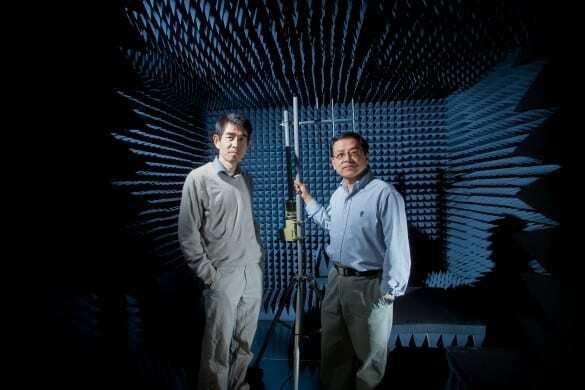 Two professors at the University of California, Riverside Bourns College of Engineering have developed a new method that doubles the efficiency of wireless networks and could have a large impact on the mobile Internet and wireless industries. Efficiency of wireless networks is key because there is a limited amount of spectrum to transmit voice, text and Internet services, such as streaming video and music. And when spectrum does become available it can fetch billions of dollars at auction. The “spectrum crunch” is quickly being accelerated as customers convert from traditional cell phones to smartphones and tablets. For example, tablets generate 121 times more traffic than a traditional cell phone. Without making networks more efficient, customers are likely to drop more calls, pay more money for service, endure slower data speed and not see an unlimited data plan again. Current radios for wireless communications are half-duplex, meaning signals are transmitted and received in two separate channels. Full duplex radios, which transmit signals at the same time in the same frequency band, can double the efficiency of the spectrum. However, to make a full duplex radio, one must solve a problem: interference between the transmission and receiving functions. The technology of full duplex radio is not yet ready for the current 3G and 4G networks. The interference caused by signals from cell towers could be billions times more powerful than the ones towers are trying to pick up from a user’s smartphone. As a result, incoming signals would get drowned out. The UC Riverside researchers have found a new solution called “time-domain transmit beamforming”, which digitally creates a time-domain cancellation signal, couples it to the radio frequency frontend to allow the radio to hear much weaker incoming signals while transmitting strong outgoing signals at the same frequency and same time. This new solution is indispensable for a full-duplex radio in general while it is complementary to other required solutions or components. The new solution not only has a sound theoretical proof, but also leads to a lower cost, faster and more accurate channel estimation for robust and effective cancellation. “We believe the future applications of full duplex radios are huge, ranging from cell towers, backhaul networks and wireless regional area networks to billions handheld devices for data intensive application such as FaceTime,” said Liang, who added that the researchers have had discussions with several major wireless telecommunication equipment companies. March 19, 2019 - Will Challenges Stop Utilities from Getting the Private Wireless Networks They Need? Transmission and Distribution WorldWith FANs needing significant digital enhancements, utilities looking for private network solutions face challenges. April 18, 2019 - Huawei Details Advancements in 5G Core and RAN SDxCentralHuawei this week provided updates on its 5G core network strategy and its SingleRAN Pro solution at its Global Analyst Summit. March 25, 2019 - Planning 5G networks RCR Wireless NewsThe benefits of 5G will be felt first by IoT, smart cities, public safety and other real-time applications requiring fast wireless communications.